Volkswagen has unveiled its first soft top R model – which also happens to be the fastest ever production version of the open top Golf. This striking car is powered by a four-cylinder 2.0 litre engine which has an electronically limited top speed of 155 mph. It will do 0-62mph in 6.4 seconds. VW’s news follows yesterday’s announcement by Citroen for their soft top version of the DS3 and underlines how big the cabriolet market is in the UK. Even with our poor weather, we are still one of the biggest markets for these cars. The new Golf R Cabriolet comes with bespoke bumpers, a gloss black grille and mirror casings and the ‘R’ logo. There’s also LED daytime running lights and black painted brake callipers with the ‘R’ logo on them. Whenever I drive in Germany I’m always struck by how many black cars there are on the autobahns and VW is taking this one step further because they’ve also added a gloss black rear diffuser which is framed by chrome-tipped exhaust pipes and smoked LED rear lights to this R model. Drivers will notice that when compared to the standard Golf Cabriolet, the suspension has been lowered and alloy wheels have been added. There’s fancy stitching on the sports seats – including the letter ‘R’ stitched into the headrests – and the pedals have brushed aluminium caps. As with most modern cars there’s extensive connectivity with Bluetooth and various other interfaces. VW say the car’s hood can be lowered in 9.5 seconds at speeds of up to 18 mph (though, as I highlighted with the DS3 supposed speed limit of 75 mph you should be careful of when and where you lower or raise the roof. Certainly not at 75mph). 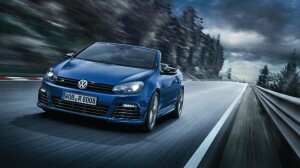 The Golf R Cabriolet is available to order, priced at £38,770 OTR. Standard Golf Cabriolets cost from £21,040 for the entry-level S 1.2-litre TSI 105 PS, rising to £30,765 for the GTI 2.0-litre TSI 210 PS with DSG gearbox. Leasing costs for the Golf R Cabriolet should be an interesting comparison with buying it yourself since Golf values generally hold up well because they remain extremely popular on the used car market. However, the initial profit margin for dealers is fairly steep so you could make a decent saving by leasing. This entry was posted in Car Updates & Releases, New Cars, Small Car, Sports Car and tagged alloy wheels, Cabrio, caption, car, citroen, DSG, Germany, Golf, Golf Cabriolet, GTI, LED, LS, mini, new Golf R Cabriolet, price, seat, speed, Speed Limit, Sport, Standard Golf Cabriolets, TSI, UK, Volkswagen, VW by Steve Lumley. Bookmark the permalink.